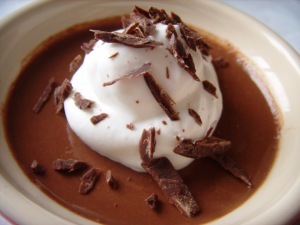 Luscious Chocolate Pots de Creme, served in dainty cups, boast just four ingredients and require only a saucepan and measuring utensils to make. A few notes about making pots de crème: be careful to cool the scalded milk a bit so it doesn’t curdle the egg yolks. Yes, I did that the first time around! Second, since this doesn’t bake, the taste of this dessert comes strongly from the chocolate you use. A good bittersweet is essential; I like Ghirardelli. As for the spiced chocolate, I like Lindt’s Chili dark chocolate. If you can find Ibarra chocolate, though, use it by all means instead of the chili-infused chocolate and nix the added vanilla and cinnamon. Finally, play with the whipped cream’s flavoring if you like; I sweetened it lightly with powdered sugar and splashed in vanilla extract, but you can add cinnamon, vanilla beans, or even pepper itself if you want. - Combine first 3 ingredients in a heavy saucepan; cook low heat, stirring constantly, until chocolate melts. - Beat egg yolks until thick and pale. Gradually stir about one-fourth of hot mixture into yolks; add to remaining hot mixture, stirring constantly. - Cook over low heat, stirring constantly, 2 minutes or until mixture thickens slightly. Spoon into individual serving containers. - Cover custard and chill. Yum, I've have yet to try type of dessert. I have never tried Pots de creme (I think. Unless I had it without knowing the name...). It looks delicious and beautiful! I LOVE chocolate dessert, and I'll remember to give it a try when I get a chance at a restaurant or somewhere (I am not good with making dessert...). These pots look amazing! Delicious and creamy - yum!